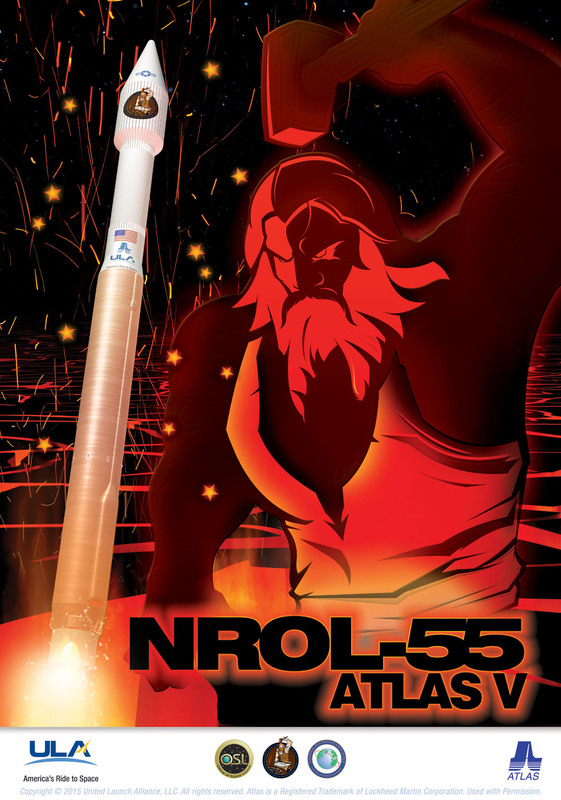 As with all satellites operated by the United States National Reconnaissance Office, the identity of the NROL-55 satellite or satellites is a closely guarded secret. Though clues such as the launch vehicle configuration, launch site, launch window and navigational warnings issued prior to launch can be used to identify the satellite with some certainty. 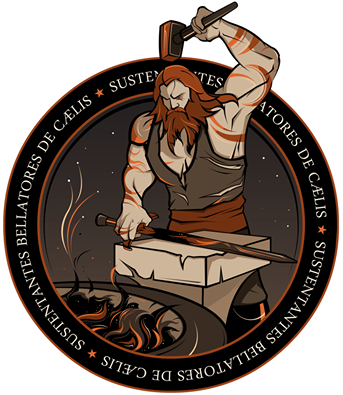 Hints within the payload mission patch can also be used to pin-point the identity of the satellite. NROL-55 launches on an Atlas V 401 from Vandenberg Air Force Base in California. A west coast launch of Atlas V carrying an NROL payload already narrows the identification of the satellite(s) down to just three options, though the possibility of this being a new or one-off satellite still needs to be evaluated. The three known NRO satellites to launch on Atlas from Vandenberg are NOSS (Naval Ocean Surveillance System), Trumpet Electronic Intelligence Satellites and FIA-Radar imaging satellites. Trumpet satellites have used Atlas V 411 and Delta IV M+ (4,2) rockets while FIA-Radar launches have to date used the larger Atlas V 501 and Delta IV M+ (5,2) vehicles. As this launch uses the 401 version of Atlas, NOSS seems to be the most likely option since the recent launches under the NOSS program have employed the 401 version of the Atlas V. The use of the extended payload fairing on the NROL-55 launch also points to the launch of a stack of satellites as opposed to a single payload. To add to the evidence, navigational warnings for marine and air traffic issued in the days leading up to launch match up with those of the NROL-36 launch that also carried a pair of NOSS satellites into a 63.4°orbit. Ted Molczan, a well known satellite tracker keeping track of classified spacecraft and their moves in orbit, provided additional proof of this launch being a pair of NOSS satellites. According to Molczan, the replacement of NOSS satellites has followed a repeating pattern with satellites being replaced on a ten-year cadence as seen in the 2011 NOSS 3-5 launch that replaced the 3-1 pair that had been in orbit for just over ten years and stopped flying in formation eight months after the replacement was sent to orbit. 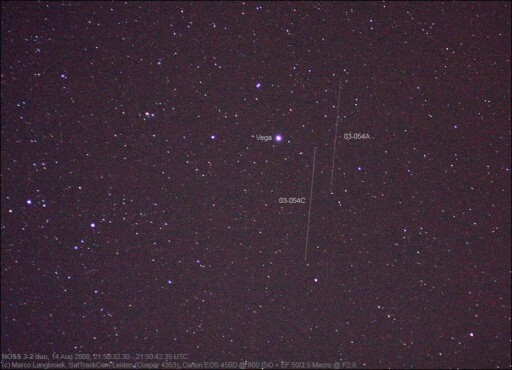 The same pattern was repeated with the 3-6 pair that replaced 3-2 that had been in orbit for nine and a half years. The Naval Ocean Surveillance Satellite project dates back to 1976 when the first generation of NOSS satellites, flying in triplet formations, was first launched – taking over from the now declassified Poppy Program that served as a NOSS precursor, launching four satellites in 1971. The purpose of the NOSS satellites is the location of foreign ships to deliver tactical information to United States intelligence agencies and the military. To accomplish their task of locating and monitoring ships, the NOSS satellites employ the time-difference-of-arrival by tracking the ship’s radio transmissions. A calculation of position requires multiple satellites to fly in a precise formation to calculate the relative geometry between the satellites and the ship through the time difference in the arrival of the signal – not dissimilar to the Global Positioning System where a ground-based receiver requires multiple satellite signals to calculate its position. NOSS went through three generations of satellites, implementing technical improvements and mass reduction. The first generation of satellites was launched between 1976 and 1987 followed by the second generation of NOSS triplets that was being launched between 1990 and 1996. The third generation, making its debut in 2005, provided a surprise as the NOSS satellite triplets were reduced to pairs of satellites. Additionally, the change from triplets to pairs also came with a change in the orbital setup of the satellites that had been launched to 1,110-Kilometer orbits at an inclination of 63.4° since their conception. The newer satellites entered orbits around 1,000 by 1,200km, 63.4° to avoid a phenomenon discovered during the initial operations of NOSS – a gradual increase in orbital eccentricity due to perturbations caused by Earth’s gravitational field. The new setup, as detailed by Ted Molczan, launches the satellites into an orbit with an argument of perigee near 180 degrees. The argument of perigee shifts gradually to 90 degrees and with that, the orbit becomes circular at 1,100 Kilometers around four years after launch. The orbital precession then continues and the orbit becomes elliptical again, reaching 1,000 by 1,200 km again after eight years, likely the operational life of the satellites. Technical details on the NOSS satellites are only sparsely available. They are built by Lockheed Martin and operated by the U.S. Navy under the code name ‘Intruder’ according to information leaked out in 2013. Stationkeeping between the satellites is likely accomplished by modifying their ballistic coefficients through the use of external panels that can adjust the area faced to the ram direction where minute drag effects can be utilized to slowly modify the orbit. 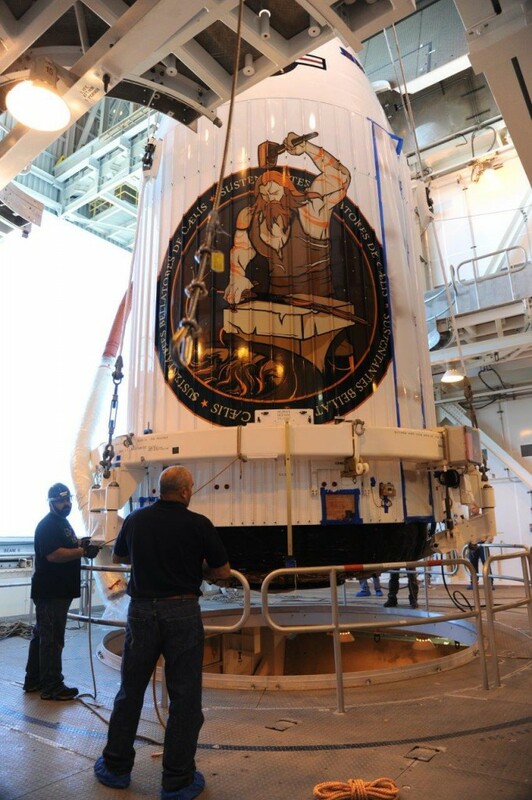 Reportedly, the two-spacecraft NOSS stack launching on Atlas V has a mass of around 6.5 metric tons. The Naval Ocean Surveillance Satellites in their initial triplet constellation were closely copied by the Chinese. 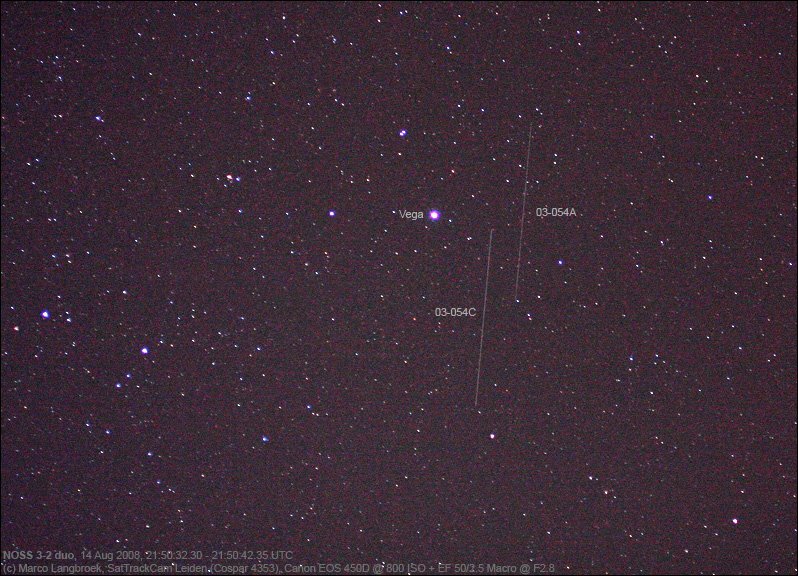 Triplets of Yaogan satellites, China’s primary military reconnaissance satellite constellation, were launched starting in 2010 and entered orbits similar to the first two NOSS generations.